My Wandering Life: Happy 4th of July! It's after midnight, and therefore actually the 5th here in China, but in America everyone is just waking up and preparing for a day of BBQ and fireworks to celebrate America's national day. We too had a BBQ as part of our normal Friday night summer routine at a friend's house, but the heavy rain today meant no fireworks (though if there are going to be any, as part of China's normal almost-every-night burst of fireworks somewhere in the city, they tend to start around 2:00 a.m. The night is still young!). Today marks 11 years since Benjamin's heart surgery and one year since my hysterectomy. His surgery was done at Stanford, and my surgery was done by a local Chinese doctor who trained at Stanford. I love the synchronicity! We're both doing pretty splendid. 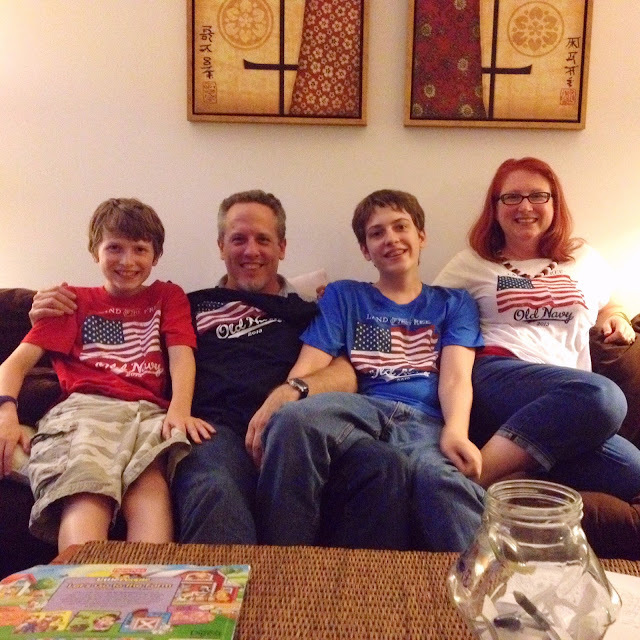 We waited an entire year to wear those American flag shirts above, purchased on clearance from Old Navy's website right after last 4th of July and then brought to Shanghai in a friend's suitcase late last summer. I'm glad they still fit our growing kids! Happy Birthday America! Shengri Kuaile Meiguo!